Venice, California - Google's 45,000 square foot headquarters in Venice California became an art gallery for a day as the the Venice Family Clinic's Art Walk and Auctions brought together over 350 artists displaying their works to 6000 attendees last Sunday throughout the search giant's bright roomy post modern interior and courtyard. The artists were all supporting the Venice Family Clinic as they have for the last 35 years, with proceeds from every sale going to support the clinic's work helping to fund health care for the 24,000 low income, uninsured and homeless patients at ten locations throughout the community that they offer service to every year. 50 local artists also opened their studios to tours as many have for years where attendees could meet the artists, see where they worked and buy art directly from them or during the silent auction. Laney Kapgan, VFC's chief development officer was thrilled with the community's show of support. One of the most special parts of Venice Art Walk is this very tangible connection with the artist participation, the attendees participation and the health of our community. It's a very local impact. 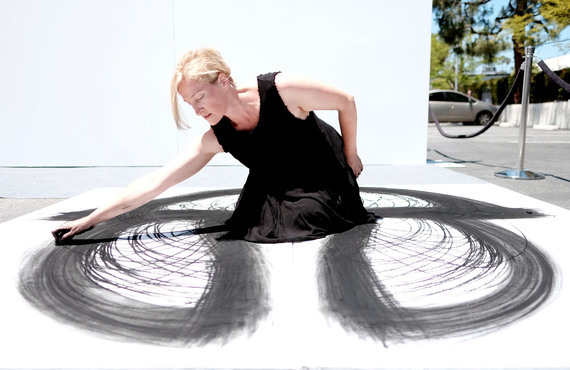 The event was started by artists to provide health care for themselves and their neighbors in need. That happened back three decades ago. This is our 36th year. Handsome, laid back and kind to a fault, Guy Dill still carries the cool Venice vibe that makes one wish they could still hang out in the art scene back in the 1970s. He told me he was one of the artists first approached by the Venice Family Clinic back when this crazy idea for an 'Art Walk' was a totally grass roots idea, where artists would open their studios and let people in. VFC would promote it, and that would be 'Art Walk'. Guy quickly pointed out to me that their 'studios' were these empty warehouses that they slept on the floor on, because they were all broke and struggling. Basically Venice was a serious slum. It was dangerous, it was the place you would go to dump bodies. It didn't smell good, it smelled like 'oil products' because that's what was here. It was a pretty ugly town. There's a reason Orson Wells did that famous tracking shot for 'Touch of Evil' here. It was funky. But then someone from the Venice Family Clinic approached them with a crazy idea. They asked how about if we got the artists work we could sell, give the artists back 50% of the money and take the other half and give it to the clinic in the same area. And every artist said that was a great idea, for several reasons. It created a kind of symbiosis where if our art was shown to a public and then gets sold, it helps the artist. In turn by selling that work we felt good about that money going to help the rest of the community. There wasn't one artist that said no. And it was very in-house. And then over time it grew into this yearly event that has this amazing turn out. One year I had 900 people come through my studio. It kind of freaked me out. 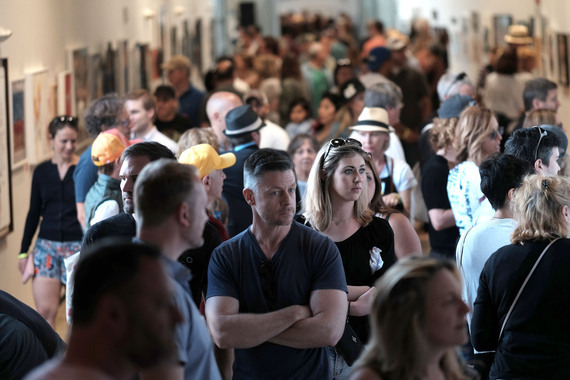 Sunday the enormous turn out shows that the Art Walk has become one of the signature annual art events Los Angeles. Guy laughed remembering the early days of Art Walk, but then pointed out how important it became to the community. The amazing part, was that there have been artists who's lives were saved by the clinic. The clinic actually took care of them. They could not only pay the rent and buy food because they sold their work, but it also helped them with medical problems, and crisis when they happened, and they did happen. That was the level they were on, Dill pointed out. He said they weren't like the starving artists today who can get a Starbucks when the muse doesn't speak to them. They didn't have the luxury of going to restaurants. "Not that there were any restaurants there anyway," he points out. And if we did get a meal it was because a collector took us. So with the Art Walk, the artists were helping their careers, the community was helped because they had a clinic and family planning, and we had a high ethnic population and gangs so the VFC was what was needed, it was a great symbiosis. I asked him about the gang members. Was it dangerous? He laughed. "well, they knew that we artists were strange and interesting, so they left us alone." His enormous studio is still in Venice, just down the street from the Art Walk, where he showed me some of his current bronze works, all sublime and delicate in their large scale, intricacy and balance. All of them look equally impossible. Many were bigger than we were and one towered 14 feet above us. That one weighted half a ton and was being prepared for shipment. Newer work in enormous pieces of cardboard were just coming off his own personal assembly line where he was figuring out where his next creative inspiration was going to take him. Standing in the Google center I marveled at the crowds passing through and looking at the artwork, young and old, twenty somethings on dates, thirty somethings with their children, and elderly couples all admiring the works on display. 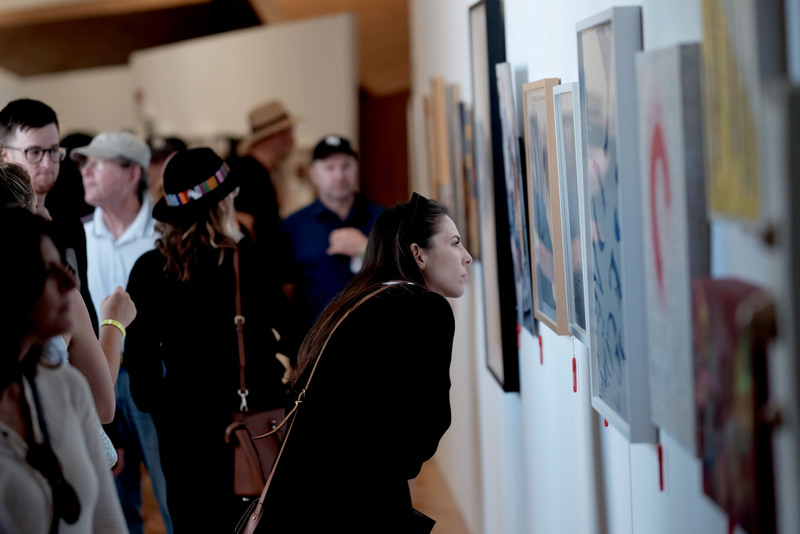 It showed the tremendous thirst in this community for connection with art and artists and for those interested in building art collections of their own. Laney echoed that. Every $50 dollars we make here is one more visit at the clinic for someone in need. But I'm thinking of buying something here as well, that's a win-win for me. I help the clinic and start my own little art collection. The VFC has a yearly budget of $30M, and raised $700K on Sunday, their largest fund raiser of the year and another big success for this neighborhood community. For more on the Venice Family Clinic. For more on Guy Dill.